CELEBRATE WITH NASHVILLE FASHION WEEK! Nashville Fashion Week 2019 is going BOLD! We've got a jam-packed schedule with seventy-five events planned next week and we look forward to celebrating with you! Nashville Fashion Week 2019 officially kicks off on Monday, April 1 with Nashville's first FREE fashion-focused Sustainable Summit moderated by Fern Mallis at oneC1TY and quickly ramps up with close to fifty Shop Nashville events, four more Learning Labs, four nights of runway shows featuring twenty local and regional designers in partnership with OZ Arts Nashville, our official NFW After Party presented by Dream Nashville and we close out the week with the 5th Annual Fashion Forward Gala. And don't forget about the Men's Style Event this Wednesday night at Dream Nashville with an After Party for guests at Snitch! There is literally something for everyone! Get your tickets at NashvilleFashionWeek.com now! Our Friday night runway shows are SOLD OUT and the other nights are selling fast! Make plans now to support your favorite designers and be introduced to new ones. 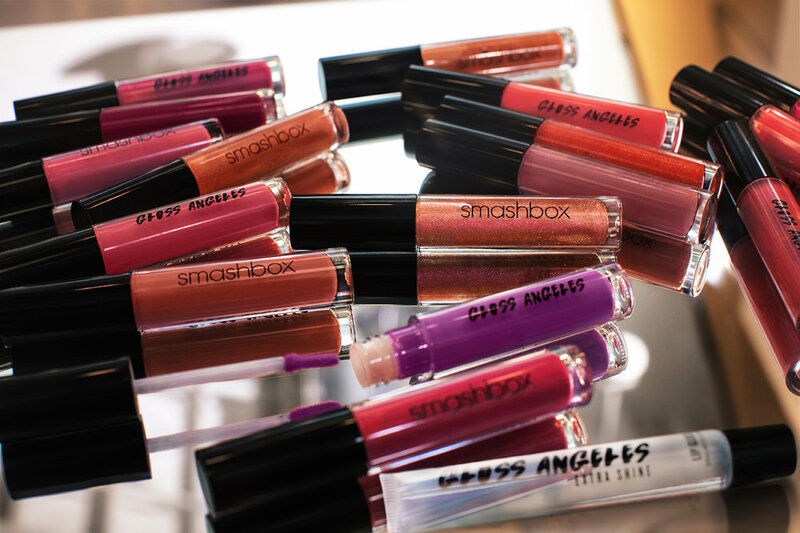 You are going to be blown away by these BOLD collections! NFW Learning Labs are designed to showcase the local fashion community by providing a platform to engage, learn and connect and each of these unique educational experiences do just that. 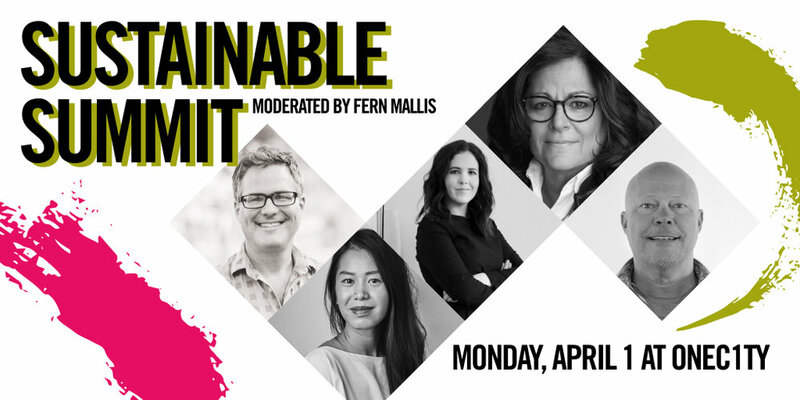 SUSTAINABILITY: Join us on Monday, April 1 at oneC1TY for our Sustainable Summit, an interactive event that will include Nashville's first fashion-focused discussion on sustainability. Our panel of industry leaders - Chrissy Fogerty, Fauxgerty; Barrett Ward, ABLE; David Prentice, OnPoint Manufacturing and fashion designer Van Hoang, our 2018 Nashville Fashion Forward Fund recipient - will share their insights on how to turn ideas into action and experiences with sustainability. Get your ticket to this FREE event while they last! MARKETING: Digital Marketing Without Losing Your Mind at emma is SOLD OUT! But, tickets are still available for CREATE: Margaret Ellis Jewelry Intro to Metalsmithing | Make Your Own Stack Rings on Wednesday, April 3; and BEAUTY: Behind the Runway with The Cosmetic Market, and BUSINESS: Feast on Fashion with AMAX Talent presented by Fleming’s Prime Steakhouse - How To Land An Agent on Saturday, April 6 . Don't miss out on these unique educational opportunities! 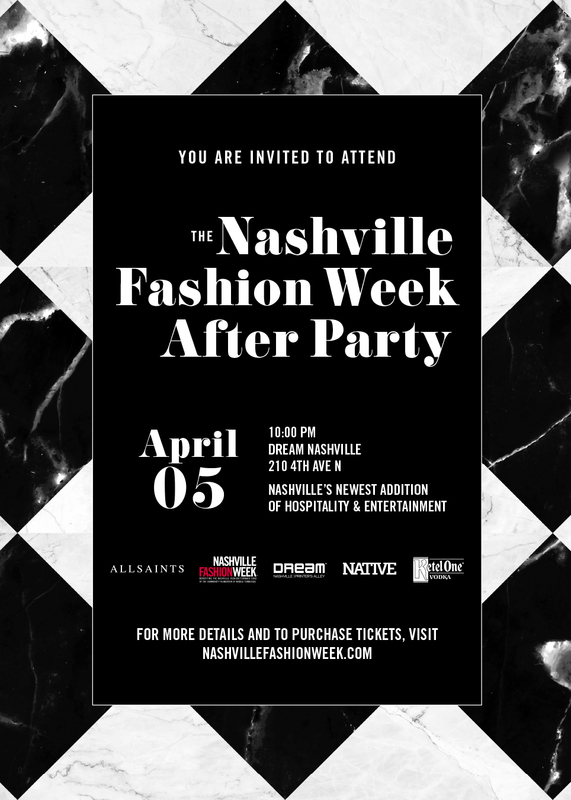 And then there are the parties… Dream Nashville is presenting the Official Nashville Fashion Week After Party on Friday, April 5 from 10:00 p.m. until 1:00 a.m. This is sure to be the party of the year! This is #WHYNFW! The Nashville Fashion Forward Fund of The Community Foundation of Middle Tennessee invites you to celebrate and support the entrepreneurial spirit of Nashville’s creative arts and fashion community with Nashville Fashion Week and our partner OZ Arts Nashville at the Fifth Annual Nashville Fashion Forward Fund Gala on Saturday, April 6 at OZ Arts Nashville. This is the fourth year that Nashville Fashion Week will present its Nashville Fashion Forward Awards at the Fashion Forward Gala to recognize community leaders that have made an impact on the Nashville fashion industry. Join us in honoring Andrew Clancey, Margaret Ellis, Claudia Fowler, Margo Price, Linda Roberts, Sofie Rovenstine and Olia Zavozina. Reserve your tickets or table for 10 by Wednesday, March 27th! You've got all of your tickets, so now the big question is "What are you going to wear to all of these fashionable events"? Click HERE for full details on every Shop Nashville event that will take place next week. Nashville Fashion Week is a great excuse to go shopping! We can't wait to see you at the shows! All proceeds from all Nashville Fashion Week events benefit the Nashville Fashion Forward Fund of The Community Foundation of Middle Tennessee. The Nashville Fashion Forward Fund is an endowed fund established to support the next generation of fashion industry professionals with ties to Middle Tennessee by providing a financial award and resources for experiential professional development opportunities. NASHVILLE FASHION WEEK IS JUST FIVE WEEKS AWAY! DO YOU HAVE YOUR TICKETS YET? Tickets are selling fast! The Influencer Brunch, scheduled for March 16 at Ellington’s Mid Way Bar & Grill at the Fairlane Hotel, and the Men's Style Event at the Dream Nashville Hotel on March 27 will set the stage for Nashville Fashion Week, April 2-6. Year nine of Nashville Fashion Week will feature four nights of runway shows featuring twenty local and regional designers in partnership with OZ Arts Nashville. The week will end with a big celebration on April 6 at the 5th Annual Fashion Forward Gala. You don't want to miss a thing! Tickets to all of these events are now on sale at NashvilleFashionWeek.com. NFW Learning Labs and the Shop Nashville schedule will be released soon. Nashville Fashion Forward recipients Eric Adler Bornhop 2015, Maria Silver 2017 and Van Hoang 2018 with their model muses. Photographed by Daniel Meigs. Models: Ashley Fisher, Bentley Caldwell and Clare Baldridge, AMAX Talent. Beauty: Joselyn Maness and Janelle Wood, AMAX Creative. Location: Wilburn Street Studio. The Nashville Fashion Forward Fund of The Community Foundation of Middle Tennessee invites you to celebrate and support the entrepreneurial spirit of Nashville’s creative arts and fashion community with Nashville Fashion Week and our partner OZ Arts Nashville at the Fifth Annual Nashville Fashion Forward Fund Gala on Saturday, April 6 at OZ Arts Nashville. This is the fourth year that Nashville Fashion Week will present its Nashville Fashion Forward Awards at the Fashion Forward Gala to recognize community leaders that have made an impact on the Nashville fashion industry. Join us in honoring Andrew Clancey, Margaret Ellis, Claudia Fowler, Margo Price, Linda Roberts, Sofie Rovenstine and Olia Zavozina. Enjoy a delicious dinner from G Catering, wine from Love and Exile Wines and spirits from Tito’s Handmade Vodka, Beefeater London Pink Gin and Jameson Black Barrel in vivid space designed by Amos Events with BOLD touches by Bright Events, Please Be Seated and Oshi Floral Design to create the perfect ambiance for this immersive evening. CraftCourse and Hi-Fi Media have planned innovative experiences for our guests that will be a BOLD punctuation to the Nashville Fashion Week experience. Artist Tess Erlenborn will live paint two pieces to be auctioned at the end of the night to benefit the Nashville Fashion Forward Fund. Dress boldly and colorfully. This is going to be a night to remember! Reserve your seat/table with ticket purchase by March 27 at NashvilleFashionWeek.com. All proceeds from Nashville Fashion Week benefit the Nashville Fashion Forward Fund of The Community Foundation of Middle Tennessee. We have some BIG news...Santa brought us an early gift with a BOLD addition to our upcoming Fashion Forward Gala plans. We can’t say it out loud yet, but it's definitely worth waiting for. The Gala will move from it's previously announced date to Saturday, April 6 at OZ Arts Nashville. The Nashville Fashion Forward Fund of The Community Foundation of Middle Tennessee invites you to celebrate and support the entrepreneurial spirit of Nashville’s creative arts and fashion community with Nashville Fashion Week and our partner OZ Arts Nashville at the Fifth Annual Nashville Fashion Forward Fund Gala on Saturday, April 6 at OZ Arts Nashville. The Gala will close out Nashville Fashion Week as it has since 2014. This is the fourth year that Nashville Fashion Week will present its Nashville Fashion Forward Awards at the Fashion Forward Gala to recognize community leaders that have made an impact on the Nashville fashion industry. This is the first year that award recipients have been announced prior to the event as a way to ensure that they receive the attention that they deserve over the months leading up to Nashville Fashion Week. Many more details about these talented people and their contribution to our fashion community will be shared with you after the first of the year. Special holiday pricing of $200 per ticket has been extended through January 31. Individual tickets after January 31 will be $250 and tables of 10 for $2,500. Reserve your seat/table with your ticket purchase by March 27 at NashvilleFashionWeek.com. The ninth Nashville Fashion Week will be held April 2- 6 in partnership with OZ Arts Nashville. All proceeds from Nashville Fashion Week benefit the Nashville Fashion Forward Fund of The Community Foundation of Middle Tennessee. Please contact Nashville Fashion Week to discuss available sponsorship opportunities for all NFW events. Save These Dates... Fashion is More Than A Week! WHAT WOULD YOU DO TO IMPROVE YOURSELF IF GIVEN THE OPPORTUNITY? Nashville Fashion Week was conceived in 2010 to foster and support Nashville’s heralded community spirit and concentration of creative, fashion-forward and entrepreneurial talent with an ongoing, sustainable focus for philanthropic support of our creative community. 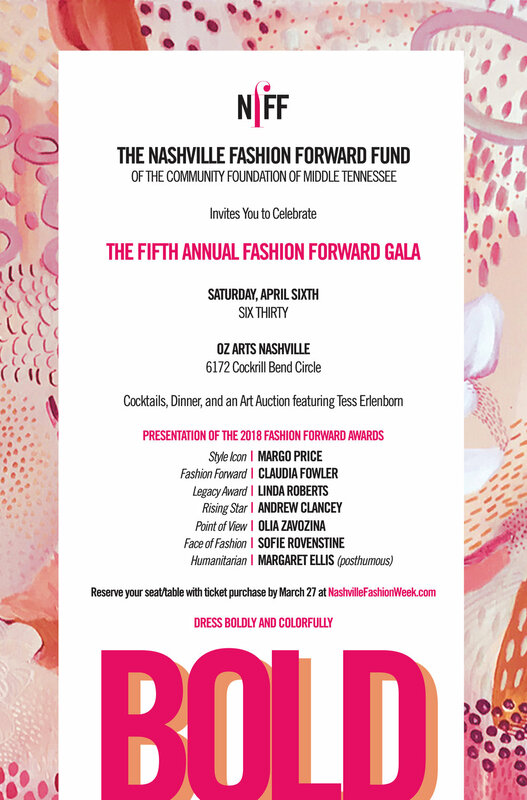 All proceeds from Nashville Fashion Week benefit the Nashville Fashion Forward Fund of The Community Foundation of Middle Tennessee. The NFF Fund gives an annual award to advance the career of select local talent with demonstrated experience in a fashion-related field each year and ensures that Nashville Fashion Week will impact the Nashville fashion community for many years to come. Get ready...The Community Foundation of Middle Tennessee will accept applications for the Nashville Fashion Forward Fund from September 6 - October 19. Professionals working in all aspects of the fashion industry with ties to middle Tennessee, from designers and photographers to stylists, models, hair and makeup artists, retail owners and bloggers, are encouraged to apply. Start thinking about the best way to present your case for an experiential professional development opportunity that will develop and enhance you, your career and ultimately our fashion community. 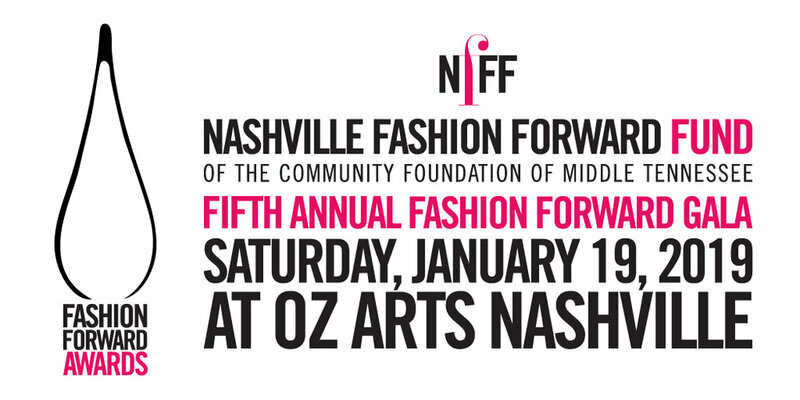 The NFF Fund award is provided each year through proceeds from Nashville Fashion Week. Previous NFFF recipients include apparel designers Maria Silver, Eric Bornhop, Julianna Bass and Lauren Leonard Phelps; fashion photographer Brett Warren; accessory designer Ceri Hoover; and Elise Joseph, founder of Pennyweight and Goodwin. You could be next! NEW DATE! The Nashville Fashion Forward Fund of the Community Foundation of Middle Tennessee invites you to celebrate and support the entrepreneurial spirit of Nashville’s creative arts and fashion community with Nashville Fashion Week and our partner OZ Arts Nashville at the Fifth Annual Nashville Fashion Forward Fund Gala on Saturday, January 19th at OZ Arts Nashville. Our originally proposed Gala and Fashion Forward Awards date was slated for fall, but we made the decision to move this event to January to avoid several industry-wide conflicts and accommodate some exciting new updates for our program. Save the date and please stay tuned for all of the details to come! Nashville Fashion Week ended year seven with the fourth annual Nashville Fashion Forward Gala and presentation of the Fashion Forward Awards at Track One on Saturday, April 8. The 2017 Gala, co-chaired by Kimberly Lewis and Gen Sohr, was created to celebrate and support the resolute, entrepreneurial spirit of the Nashville fashion community following the week-long festivities and that it did! AmosEvents created a dreamy indoor garden party with 2016 NFF recipient Brett Warren’s larger than life fashion photographs centerstage. Butch Spyridon, President of the Nashville Convention and Visitor's Corp, Natalie Chanin, founder of Alabama Chanin and fashion photographer Brett Warren served as keynote speakers of the gala with Shelly Colvin performing two musical selections for the fashionable sold out crowd. The Nashville Fashion Week co-founders, Connie Cathcart-Richardson, Marcia Masulla and Mike Smith presented the awards with sponsors Margaret Ellis Jewelry, PictureBooth.co and Tito's Handmade Vodka. Barrett Ward is the founder and CEO of FASHIONABLE, a fashion company with a mission of creating sustainable business opportunities for women. Their products, which include handmade jewelry, premium leather, apparel, and woven goods, are created by women who have overcome extraordinary circumstances, ranging from prostitution to addiction to a lack of opportunity due to poverty. Currently, over 300 women are employed globally because of FASHIONABLE, in areas including Nashville, Ethiopia, Peru, and Mexico. Native Nashvillian Sandra Lipman is well known across the community as a tireless advocate for community organizations and non-profits. She has strategized and chaired some of Nashville’s most important charitable events over the years, including the Junior League’s Showhouse, Iroquois Steeplechase, Symphony Fashion Show, the first Power of the Purse luncheon for the Women’s Fund of the Community Foundation, the first Frist Gala for the Frist Center, Symphony Ball, Ballet Ball, Cheekwood’s 50th Swan Ball and many more. David Levy is fifth generation owner of Levy's, founded in 1855 by his great-great grandfather. He joined the company in 1977 after the passing of his father, Ralph Z Levy, Sr. Having grown up in the business, it was only natural that he would lead the company into the 21st century. Levy's has been named continuously to the Gold Standard list of outstanding men's specialty stores since 2001 and been a presenting sponsor of NFW since 2011. Renae is a Nashville native and a professional hair and makeup artistwith a special emphasis on translating fashion and runway beauty trends into wearable hair and make up looks for clients in the salon. She started Lucy Pop Salon in 2010, where she continues to work with clients and lead a staff of 18. Her freelance work has been featured in publications like Porter Magazine, Nylon Magazine, and Teen Vogue, and she is an educator for the fashion focused, luxury hair care brand, Kevin Murphy. Cassie founded her personal blog Womanista.com in 2012 as a way to connect with and empower women while on the road touring with her husband Charles Kelley from Lady Antebellum. Womanista expanded as a media lifestyle brand in 2015 with contributing writers and bloggers and now has over 7 million unique registered users. Renee Peters grew up in Nashville, but is now living and working in New York City as a Wilhelmina model and an advocate of sustainable living. She strives to be a role model in all that she does, using her platform for positive change. Her blog Model4GreenLiving seeks to reshape the way people think about environmental issues and to show that it’s cool to care. She uses her social media to send a message of self-love and body-positivity and to encourage mindful, sustainable living. Renee volunteers, is an environmental activist, as well as a budding philanthropist in her free time. View photographs from the Gala as well as runway shots, back of house sneek peeks and party pics from throughout the week at NashvilleFashionWeek.com. Sign up to receive the latest NFW news and updates. Copyright © 2019 Nashville Fashion Week. All Rights Reserved.